The first book I found ("on my own") and read about adoption (before ever committing to one ourselves) was I Love You Like Crazy Cakes . This is the story of a mom who goes and picks up her new daughter in China. The story is told by the mother who talks about how excited she was to bring a daughter home to love. She talks about the anticipation, the joy and the affection which is wrapped up in it. Of course, the theme saying of the book is, "I love you like crazy cakes!" The positive aspect of this book is that a.) it deals with the topic of adoption b.) in a way that shows great amounts of love for the child. It's a cute saying that helps make this particular book endearing. The third book I present to you is one I just recently discovered. Published by Concordia Publishers, it is called Adopted and Loved Forever . This story is told from the perspective of the older child who was brought into a family via adoption. It's an affirmative and affirming statement to her parents that she knows she is loved and cared for. The book is earmarked for ages 4-7 and is designed to help children understand why and how they were adopted and why adoption is forever, no matter what happens. There is a thankfulness and gratefulness expressed in this story which I particularly like. The book shouts, "YES, we LOVE you and we ALWAYS WILL!" No matter what. Lastly, one of our favorites is one that we don't even read the actual words to. (This book is definitely above our reading/comprehension level.) 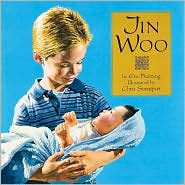 I adapt Jin Woo , renaming the characters to match our own family, and describing how "brother" will come and be a part of our family through the use of illustrator Chris Soentpiet's art work. In this story we meet a family of three - Daddy, Mommy and a little boy with blonde hair and blue eyes who also happens to be named "Bookworm1" (oddly enough!). Bookworm 1 is going to have a brother and the whole family is excited about it! On and on the story goes and it is remarkable how closely this book matches our own family situation. A friend tipped me off to Jin Woo and I owe her a note of thanks. This brought the concept to life for Bookworm1 and so I'm particularly fond of this particular adaptation of our own story. ha! I know there are other picture books out there but it's kind of hard to find really good ones. If you know of any particular titles for children that are positive in nature, I'd love to hear about them. In the meantime, these are the ones I can recommend to enjoy. Happy Read Aloud Thursday to you! How great that there are so many books out there to help your family get acclimated to the concept of adoption. That last one in particular looks like a real treasure. Kudos to you for prepping Bookworm1for the upcoming changes via bibliotherapy (biblioministry?)! These look like great choices! We did check out a book about a child adopted from China several months ago, and I think it was very good. I'll try to look for it on our next library trip. I'll have to stop by here if I ever do adopt. I love that your son thinks babies come on planes! One of the favorite adoption books at our house is "A Mother for Choco" by Keiko Kasza. It doesn't deal directly with adoption. (In fact, I'm not sure if my daughters have even realized yet that it is about adoption). Instead, it talks bout how a mother doesn't have to look like the baby to be a Mommy; it's the love that counts. It's a sweet story and a funny one. I've heard that "A Blessing from Above" is good but we haven't read that one. Congratulations on your upcoming adoption! As a twice-adoptive Mom, I am passionate about adoption as well! As for babies coming on airplanes, my niece (who is used to seeing our babies come home on airplanes) was confused when her baby brother came from a hospital instead of an airport. Not nearly as exciting to her! Thanks for sharing - I'm definitely adding these to my reading list or maybe directly to my Amazon shopping cart! My husband and I are currently working with our little guy to prep him for his baby sisters arrival (from Ethiopia!). What great stories! My sister adopted all three of her children, so we are always supportive of adoptive parents around here. When my sister complained that her youngest was growing up and she wouldn't have anymore babies around, her son said, "Just have that lady grow you another baby, then we can get bigger and you'll have a baby at home!" So sweet. 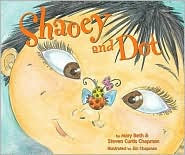 I love Shaoey and Dot. It is so wonderful! Your blog is wonderful. Being a teacher, I am always on the lookout for books that address these topics in a childlike manor. I have all of these on my list to look into. Thanks for such great info. The Red Blanket is a nice adoption story. Thanks for sharing these. I think adoption is a wonderful thing. There are so many children in the world who need good homes.